After generations of turmoil, the four factions have finally put their differences aside to work together for a better tomorrow. As a commitment to this alliance, the world’s first airborne city, named Skyward, is to be built above the intersecting borders of the four realms. 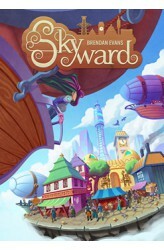 Tasked with building this new city, you and other cultural luminaries vie for control by becoming the Warden, and ultimately declared “Founder of Skyward”. In Skyward, the Warden deals cards from the central deck and splits them into piles however they see fit. Each player chooses a pile, providing them with buildings and resources. However, being the Warden is a double edged sword. While you wield the power of the split, everyone else gets to choose first, leaving you with the remaining pile. Skyward&..